It’s clear that the simple Scotland vs England comparison used by GERS and much-loved by our media distorts the picture with the inclusion of the overheated economies of London and the South-East, and that Scotland’s ‘deficit’, if you want to play the game for the moment of accepting GERS, as the Scottish Government seems to be, is in the middle range for the different parts of the UK. 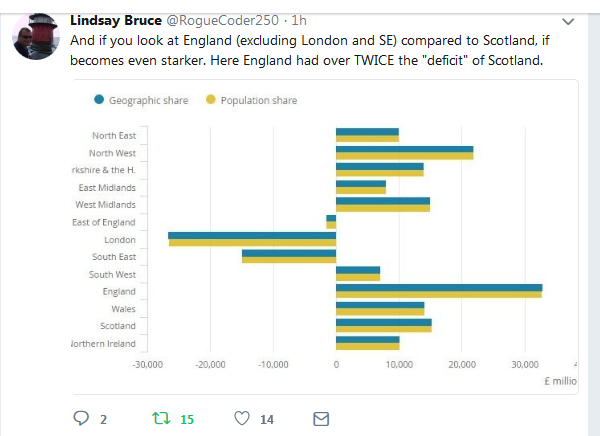 That London and the South-East have a huge surplus while the other parts have a deficit is testimony to the laissez-faire economics of successive UK governments and the consequently unhealthy concentration of economic resources in a small, overcrowded, polluted and unliveable for most, corner of the UK. Wow – impressive table that Lindsay found there. The London Effect really does remind one of Ancient Rome and the various ‘provinces’ paying tribute to the Central Power. Scary stuff – Wakey Wakey Scotland – this stuff is real and is happening to a Nation near you. I like the Rome analogy – a she implodes, I’d rather stand back at a distance than do what the Celts did. A picture is worth a thousand words. Clearly London and the area local to it constitute a different country but only after soaking up just about all of the financial capital investment and development funds. Excellent contribution to the dialogue. I’ll retain it for future use. Now let me guess. Where are ‘headquarters’ located? They claim to be able to disperse the accounts of income but some will surely accrue in the HQs unfairly. Presumably the “acceptance” of GERS is because after a year of Scotland being a normal functioning democracy the revenue and expenditure figures can be compared to what happened as part of the UK and thus show decisively that we made the right choice to end the UK. Take overheated London and SE out of the equation and we are on par with the rest of the UK , considering our population we are punching above our weight , roll on Independance ! . Westminster, the BEEB, corporatism, oligarch funded politico’s, casino capitalism, home to all who would keep us ignorant and docile. Remember when we were to be “richer than Switzerland”? Well it was London which got the loot; Labour and Tory governments made sure of that (directorships, plush offices and an Ermine cloaked retirement home in return). The Home Counties which houses the City Slickers and their families. You can sell a bungalow down there and buy a castle in Scotland. And us—ALL we have to do to escape this scam democracy, is to put our tick in the right box. Sure it MIGHT (?) be tough for a wee while, but put your children first—they will reap the benefit.